I have never felt I more fully embodied the role of “cultural tourist” than when I visited the 11th Havana Biennial for its opening week. 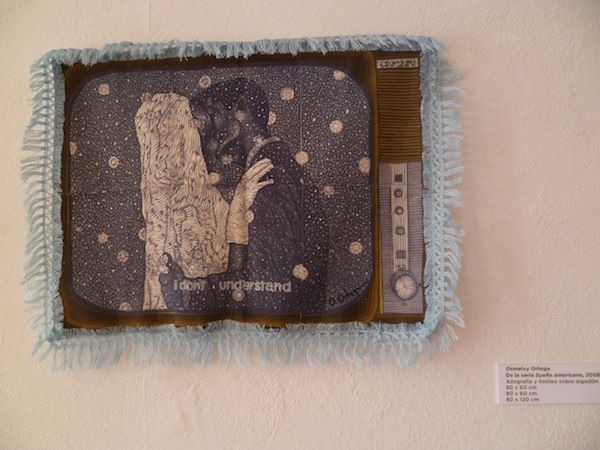 This year’s theme, “Artist Practices and Social Imaginaries,” gave the biennial cause to embrace sprawl: exhibitions, installations, performances and events are scattered throughout Havana. Exhibition spaces range from the established and expected — for instance, the Wifredo Lam Contemporary Art Center, which organized the biennial — to the historic and the ephemeral. 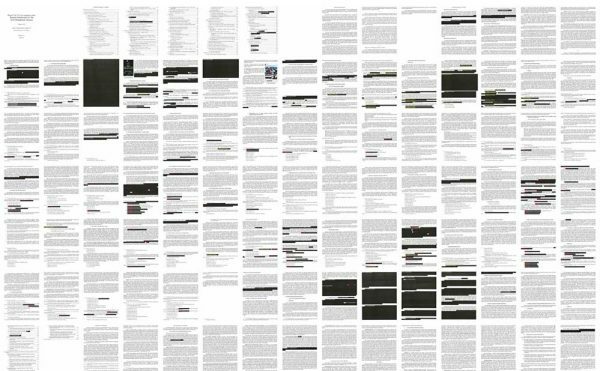 The curatorial statement for this year’s edition focuses on “the role of art in the transformation of objects and as catalyst of social subjects.” Before I left, I explained the theme to friends as “socially based practice, more or less” and left it at that. Now that I’ve returned, however, I find myself speaking of my understanding of the biennial as very much inseparable from my experiences navigating its sites within the city. 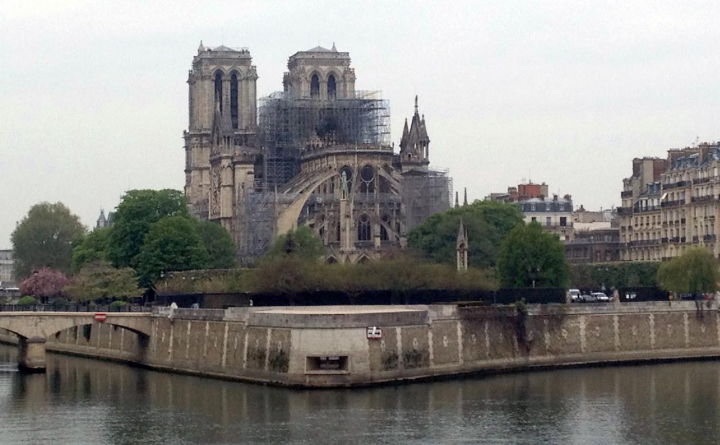 The point of the somewhat nebulous “social imaginary” seems to be how social and physical interactions, in my case defined by my status as a foreigner, ultimately color visitors’ perceptions of the artwork they see. Cuddly metal sculptures like this one by Cuban artist JEFF (aka Jose Emilio Fuentes Fonseca) greeted visitors at several Havana Biennial sites, often paired with cotton candy. At least, that was what it felt like for me, this being both my first trip to Cuba and my first visit to a large-scale international biennial outside of New York. I was one of the few Americans not there as part of a larger tour group and thus free to create my own itinerary, for better or for worse. 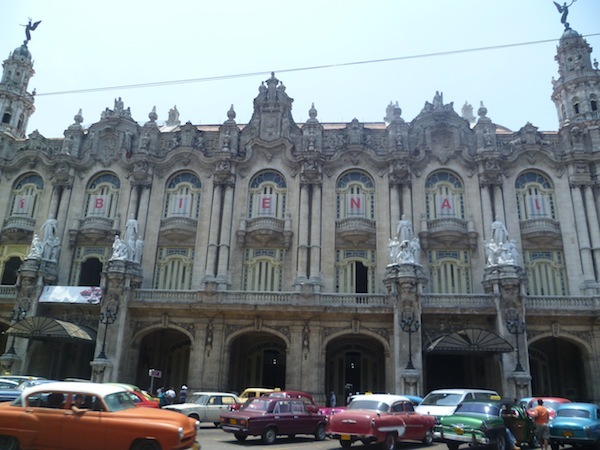 I spent much of my time in the tourist magnet Habana Vieja, the recently restored section of the city, with blue colonial architectural embellishments and cobblestone plazas. The area holds many of Havana’s top historic and civic sites — the kind of places I would likely be visiting even if many of the biennial’s exhibition spaces weren’t also situated there. 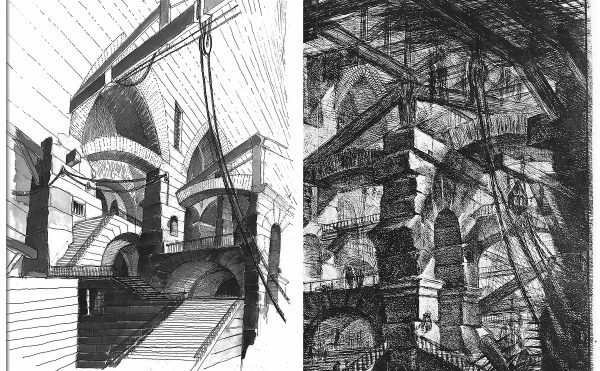 The primary exposition halls — the Great Theater of Havana, which displayed international artists, and the Fortress of San Carlos de la Cabaña, which displayed Cuban work — boast foreboding historical presences and impressive vistas. 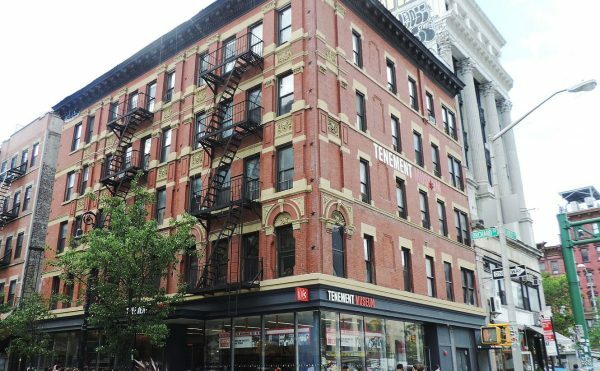 A large number museums, galleries, collaborative artist workshops and art schools across the city also host group exhibitions for the biennial. 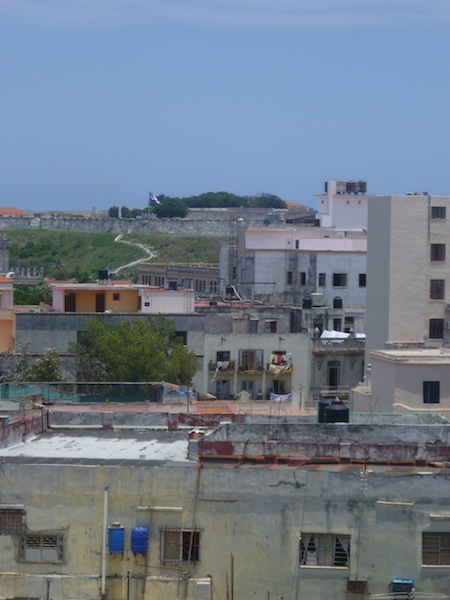 A view of the Fortress, pavilion for Cuban art in the biennial, taken from the rooftop that holds Havana's camera obscura. 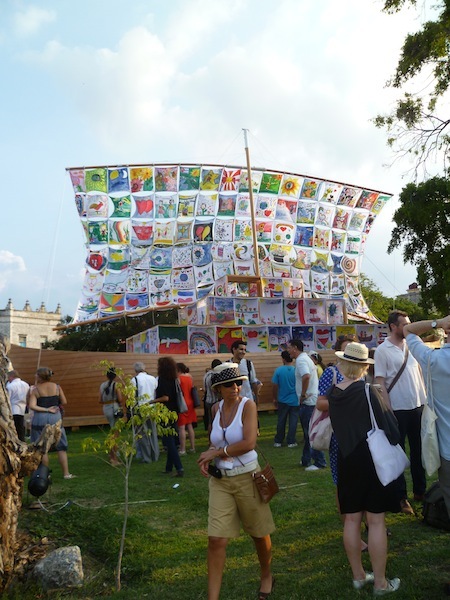 US- and Russia-based artist couple Ilya and Emilia Kabakov's project "The Ship of Tolerance" (2012) was created with the participation of local schoolchildren. 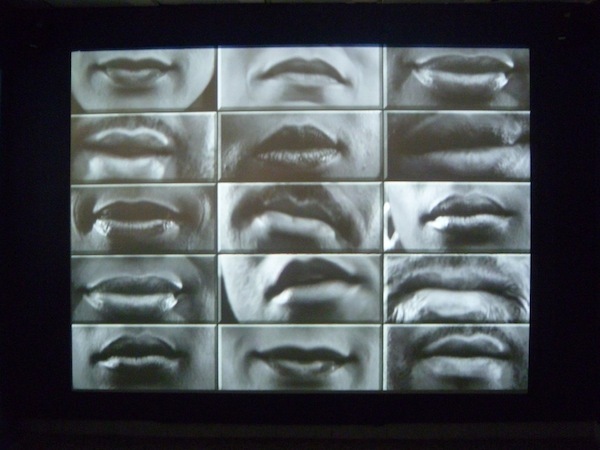 "ADN" (2012), by Cuban group Colectiva Quintapata, is a four-channel video installation of rules about chewing gum, accompanied by pieces of gum that viewers are encouraged to chew and play with at will. 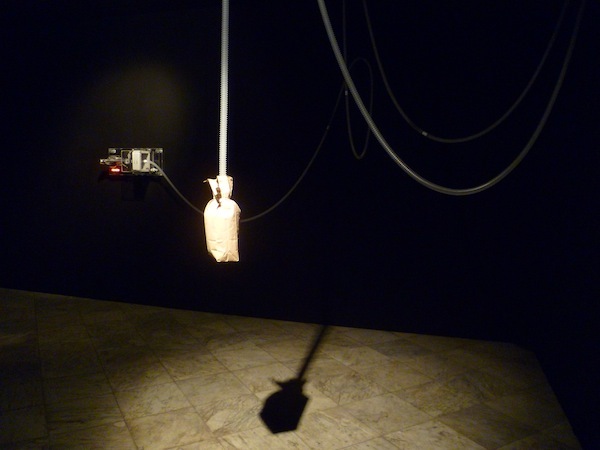 Mexican artist Rafael Lozano-Hemmer's installation "Último Suspiro" (2011) features a paper bag hooked up to a lung-like machine, timed to breathe in and out at the same rate as the average human body at rest. 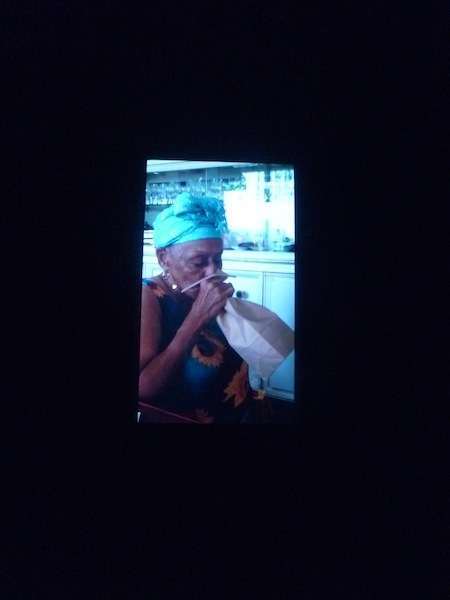 The breath in the bag belongs to the famous Cuban singer Omara Portuondo, shown on a small video. My fellow biennial visitors ranged from the easily spotted international tourists, wearing tote bags and name tags and speaking in languages other than Spanish, to locals laughing with their families and friends. As an African-American with some conversational Spanish skills, I occupied an ambiguous identity, sometimes confused for an Afro-Cuban, other times implored to buy a souvenir. I could be an unnoticed fly on the wall one moment and then instantly recognized as out of place, like the buzz of an indoor mosquito, the next. I felt as though my status shared the qualities of the biennial’s installations, in some instances belonging to the moment and surroundings and in others clearly functioning as a cog in Cuba’s tenaciously growing, if politically duplicitous, tourist economy. The work of Cuban artist Sandra Ramos, which explores ideas of migration and nostalgia, was featured at a number of biennial spaces. This piece, "The Closest Point" (2012), re-creates a buoy in Key West, Florida, that marks the closest point from the US to Cuba. 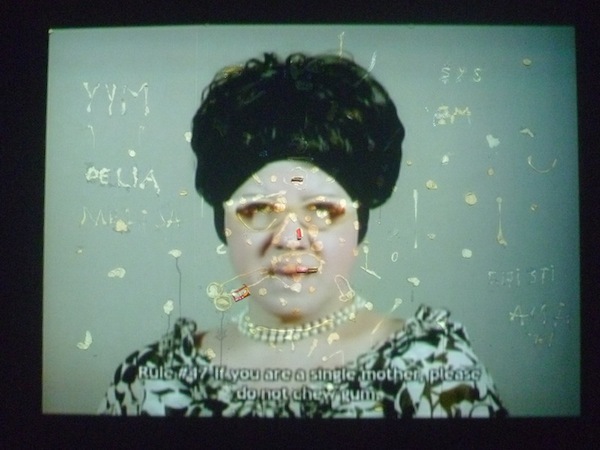 American artist Lorna Simpson's "Easy to Remember" (2001) was shown as part of "Cinema Remixed & Reloaded: Black Women Artists and the Moving Image Since 1970," a smaller version of a 2007 exhibition of the same name. 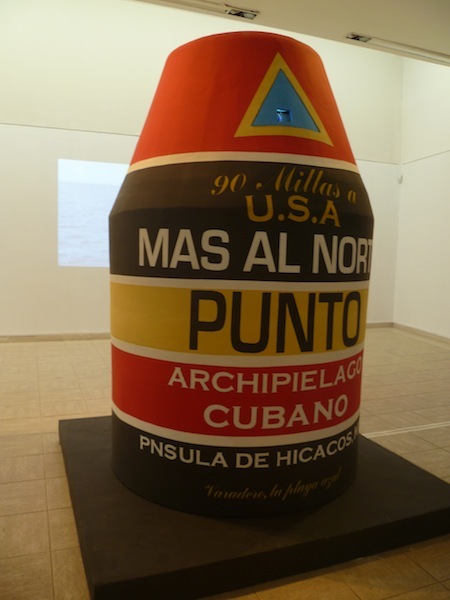 The show was curated by Andrea Barnwell Brownlee and Valerie Cassell Oliver, the first US curators asked to participate in the Havana Biennial. 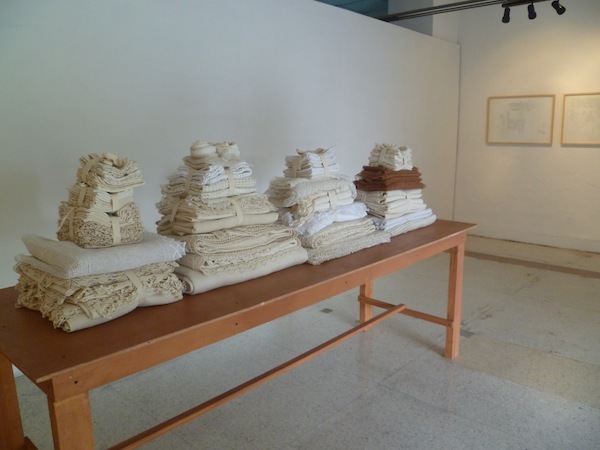 Argentinian artist Monica Millán's installation "El Vértigo de lo lento" (2002–12), shown at the gallery La Acacia, was one of my favorite pieces. Her delicate, seemingly continuous line drawings depict people who make ao po'i, a cotton, lace-like fabric, by hand in Paraguay. Each drawing also features a brief interview with the person depicted, written in curly script. A piece from Cuban artist Raúl Martínez's collage series "De La Conquista (From the Conquest)" (1990–91), on view at the gallery Factoría Habana. A sense of discovery and serendipity pervaded, given the sizable number of one-off happenings and installations strewn about the city. On my way to lunch or taking in a view of the sea from the sidewalks of the Malecón, I stumbled upon street installations of sculptures or murals, usually marked by the biennial’s red “11” logo. I could get lost and miss a scheduled performance but end up exploring an unexpected exhibition of collages in a hotel café where I stopped to get a drink. Emblazoned in Spanish on biennial-sanctioned pedicabs was the motto, “If it’s not coincidence, it’s not contemporary.” When you’re a tourist, sometimes everything feels like a coincidence, even if you know better. 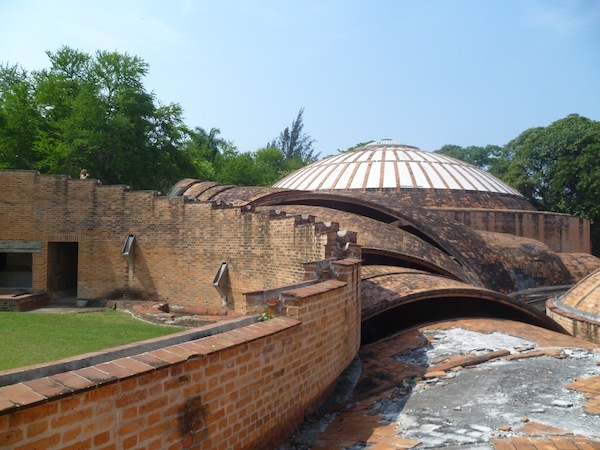 Mexican artist Gabriel Orozoco's installation in the ruins of the ballet school at Instituto Superior de Artes was a highlight of the biennial. 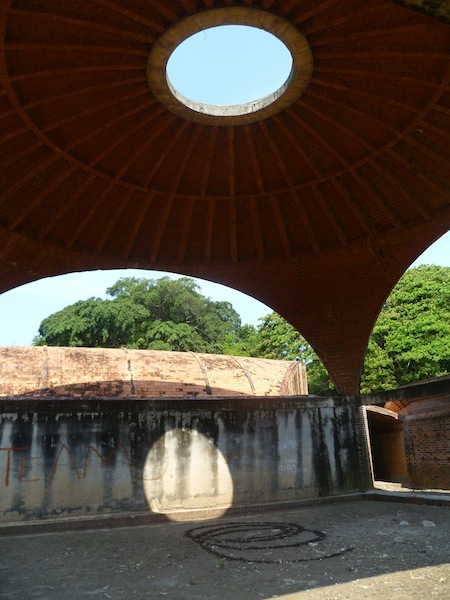 Orozoco and students of the school made interventions in the dust and debris of the old red brick domes, originally designed by Vittorio Garatti in 1963. Walking through the ruins' unusual shapes and shadows, I felt a sense of discovery, sometimes unsure of what curious decay had been made by Orozoco and what had just been left behind. A piece from Cuban artist Osmeivy Ortega's "Sueño Americano (American Dream)" series of woodcut prints on cotton rags, each with a colorful fringe. The images depicted evoke a kind of pop cultural nostalgia, of dreams projected out at mass audiences but rarely realized in full. 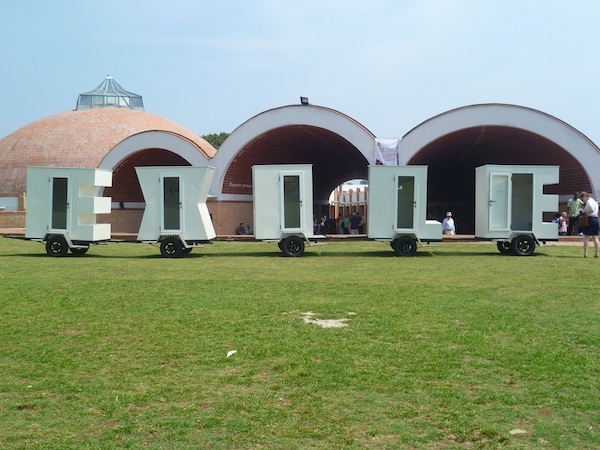 Cuban artist José Ángel Vincench's installation "Exile" (2011–12) was one of many pieces in the biennial dealing with migration and displacement. 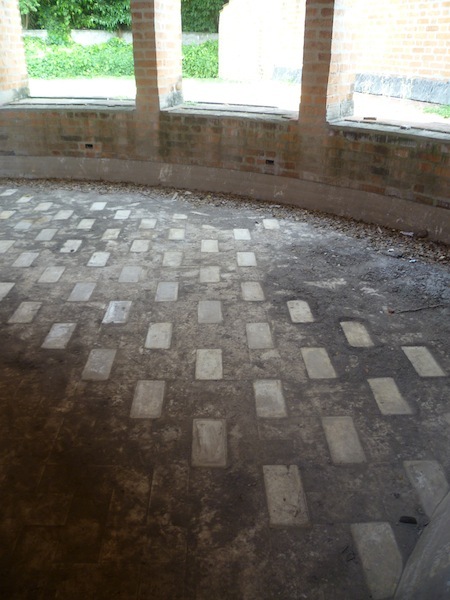 Cuban artist Jorge Rodríguez Diez's installation from his "Lost" series, at the Fortress pavilion. 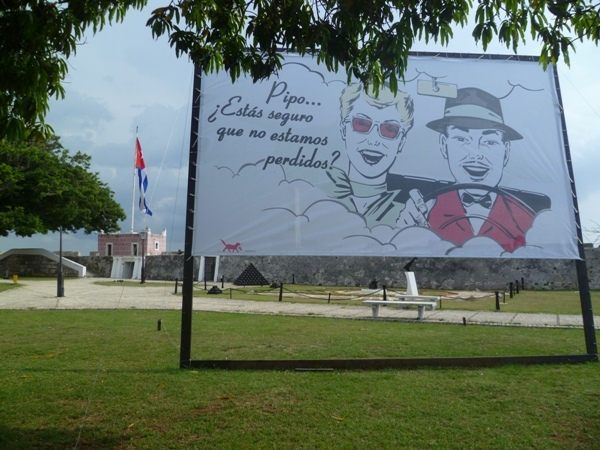 The text reads, "Pipo ... Are you sure we're not lost?" as the figures float through clouds — a not unfamiliar sentiment for me while traversing the biennial. The Havana Biennial is on view in Havana, Cuba, through June 11.